Tubulin is composed of a heterodimer of two closely related 55 kDa proteins called α and β tubulin. These two proteins are encoded by separate genes, or small gene families, whose sequences are highly conserved throughout the eukaryotic kingdom. Consequently, tubulin isolated from porcine brain tissue is highly homologous to tubulin isolated from any eukaryotic source. In biochemical terms, this fact results in the technical benefit that porcine tubulin (in the form of microtubules, see below) can be used to assay tubulin associated proteins originating from many diverse species, e.g. : yeast (1,2,3) and fruit fly (4,5). However, in pharmacological terms these minor differences can be used to enhance the specificity of drugs for certain diseasse (6). Tubulin heterodimers polymerize to form microtubules. Tubulin polymerizes to form structures called microtubules (MTs). When tubulin polymerizes it initially forms protofilaments, microtubules consist of 13 protofilaments and are 25 nm in diameter, each µm of microtubule length being composed of 1650 heterodimers. Microtubules are highly ordered fibers that have an intrinsic polarity, shown schematically in figure A. Tubulin can polymerize from both ends in vitro, however, the rate of polymerization is not equal. It has therefore become the convention to call the rapidly polymerizing end the plus-end of a microtubule and the slowly polymerizing end the minus-end. In vivo the plus end of a microtubule is distal to the microtubule organizing center. 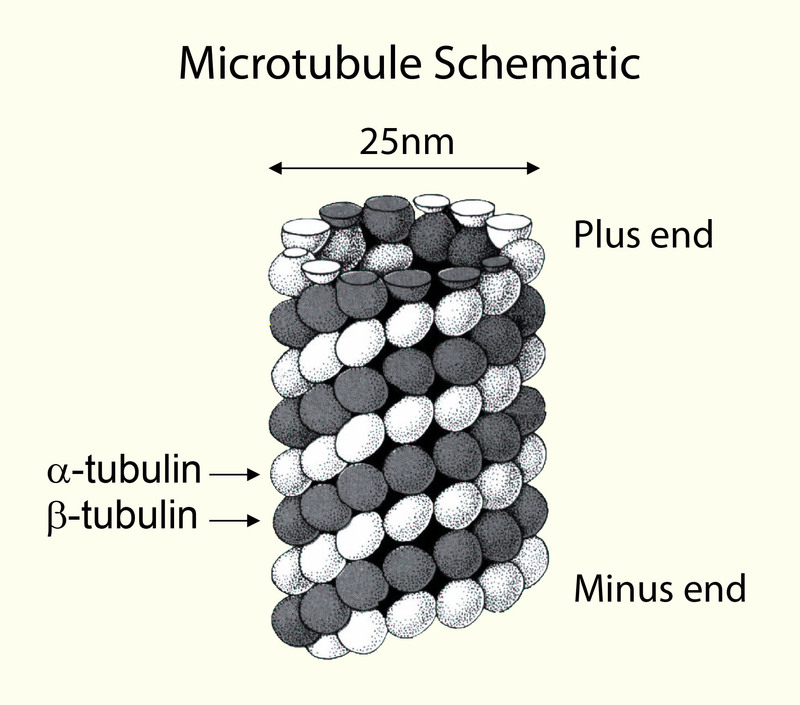 A) Schematic representation of a microtubule. B) Electron micrograph of in vitro assembled bovine microtubules (11,000 x magnification). Tubulin polymerization can be followed by using a spectrophotometer. Microtubule assembly characteristics; as determined by absorbance at 340 nm. Method: Tubulin (5 mg/ml) in G-PEM buffer pH 6.8 plus 10% glycerol was incubated at 35°C in a cuvette. The optical density at 340 nm was taken at time intervals. A value of 0.8 OD unit indicates that >90% of the tubulin has polymerized. Determining the type of polymerization conditions that are necessary for your experiment. The intrinsic ability of pure tubulin to polymerize in vitro is very much a function of the experimental conditions. For example, one can manipulate the polymerization reaction to give microtubules of a particular mean length distribution or create conditions under which tubulin will not polymerize at all until an 'enhancer' component, such as a polymerization stimulating drug or protein, is added. The following section briefly describes how and why we can regulate the polymerization reaction. A more detailed description of polymerization conditions is given with all our products. Glycerol can stimulate tubulin polymerization. The propensity of tubulin subunits to assemble into MTs is dependent upon their affinity for MT ends. In order to achieve microtubule polymerization the value of this affinity (called the critical concentration, CC) has to be less than the total tubulin concentration. Because of this parameter, pure tubulin will not generally polymerize at protein concentrations below 10 mg/ml. At concentrations above the CC, tubulin will polymerize until the free subunit concentration is equal to the CC value. In situations where one simply requires a population of microtubules it is possible to reduce the CC and force nearly all of the tubulin to polymerize. This is achieved by including in the reaction a component that will lower the CC. Glycerol is one of the most commonly used substances that lowers the CC value for polymerization. By including 10% glycerol in a polymerization reaction one can achieve microtubule formation at protein concentrations as low as 1 - 2 mg/ml. We sell tubulin without glycerol (Cat. # T240), which needs to be resuspended in G-PEM with 10% glycerol to create a solution which will polymerize efficiently on placing at 37°C. In situations where one is interested in investigating the ability of a compound to enhance tubulin polymerization it might be advisable to use tubulin in a buffer that is free of any polymerization stimulating compounds such as glycerol. We sell tubulin minus glycerol (Cat. # T240 and HTS03), which are useful for screening compounds for anti-cancer use. There are also tubulin polymerization assay kits which have all the proteins, buffers and controls in order to effectively analyze compounds and MAP type proteins (Cat.# BK006P and BK011P). In certain cases it is desirable or necessary to use modified tubulin protein. We sell fluorescently labeled tubulin that is useful in the study of microtubule dynamics by allowing one to follow the fate of injected tubulin in vivo (AMCA-labeled tubulin; Cat. # TL440M, HiLyte FluorTM 488 labeled tubulin; Cat. # TL488M, rhodamine labeled tubulin; Cat. # TL590M, X-rhodamine labeled tubulin; Cat. # TL620M) and HiLyte FluorTM 647 labeled tubulin; Cat. # TL670M. Fluorescent tubulin also has applications for in vitro assays, e.g., microtubule motor assays (see Fluorescent microtubule mobility assay kits, Cat. # BK027). Microtubules can be stabilized by taxol and non-hydrolyzable analogs of GTP. Microtubule polymerization is readily reversible, a given population of microtubules will be continually growing and shortening. This phenomenon has been termed ' dynamic instability '. However, on a practical level, microtubules can easily be stabilized by the addition of non-hydrolysable analogues of GTP ( eg. GMPPCP ) or, more commonly, by drugs such as paclitaxel/taxol. In the presence of 10 µM paclitaxel (Cat.# TXD01) microtubules are stable at room temperature for many hours. This ability to suppress microtubule dynamics is often an important consideration when designing an experiment in which stable microtubules are required. 1. Hyman, A.A., Middleton, K., Centola, M., Mitchison, T.J., and Carbon, J. Microtubule-motor activity of a yeast centromere-binding protein complex. Nature 359, 533-536 (1992). 2. Jiang,W., Middleton, K., Yoon, H., Fouquet, C., and Carbon, J. An essential Yeast protein, CBF5, binds in vitro to centromeres and microtubules. Mol. Cell. Biol. 13, 4884-4893 (1993). 3. Barnes, G., Louie, K.A., and Botstein, D. Yeast proteins associated with microtubules in vitro and in vivo. Mol. Biol. Cell. 3, 29-47 (1992). 4. Walker, R.A., Salmon, E.D., and Endow, S.A. The Drosophila claret segregation protein is a minus-end directed motor molecule. Nature 347, 780-782 (1990). 5. Zhang, P., Knowles, B., Goldstein, L.S., and Hawley, R.S. A kinesin-like protein required for distributive chromosome segregation in Drosophila. Cell. 62, 53-62 (1990). 6. Davis A, Martinez S, Nelson D. and Middleton K. 2009.